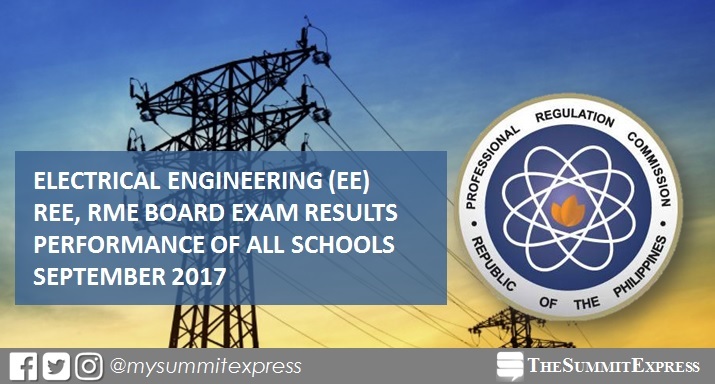 MANILA, Philippines - The Professional Regulation Commission (PRC) officially announced on Thursday, September 7, that 2,807 out of 4,460 Registered Electrical Engineers (REE) and 2,643 out of 3,864 Registered Master Electricians (RME) successfully passed the September 2017 Electrical Engineer Licensure Examinations given by the Board of Electrical Engineering in Manila, Baguio, Cagayan de Oro, Cebu, Davao, Iloilo, Legaspi, Lucena, Tacloban and Zamboanga. PRC hailed University of Santo Tomas (UST) as the top performing school for REE board exam with 98.67% or 74 out of 75 passed the exams. It was followed by Polytechnic University of the Philippines (PUP) - Sto. Tomas with 96.36% or 53 out of 55 passed. Meanwhile, PUP-Sto. Tomas dominated the schools for RME board examinations with 98.31% passing rate, 58 out of 59 successfully hurdled the test. Bohol Island State University (BISU) , Batangas State University (BatSU) Southern Luzon State University (SLSU) among the top performing schools in the September 2017 Electrical Engineer board exam. Edilbert Vallecera Tandaan from Camarines Sur Polytechnic College (CSPC) - Nabua topped the REE board with 91.80%. It was followed by Ronel del Rosario Mananap of University of Batangas, 91.70%. Meanwhile, Clint Kenneth Untayao Reducto from Capiz State University led the passers for RME board exam, 93.00%.